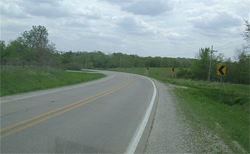 A road safety audit was conducted for a seven-mile section of County Road W-55 in Washington County, Iowa. In 2006, the average annual daily traffic on this roadway was found to be 1,290 vehicles per day. Using crash data from 2001 to 2007, the Iowa Department of Transportation (Iowa DOT) has identified this roadway as being in the top 5% of Iowa secondary rural roads with the highest density of serious (fatal and major injury) crashes for single-vehicle run-off-road incidents. Considering these safety data, the Washington County Engineer requested that a road safety audit be conducted to identify areas with safety concerns and to recommend low-cost mitigation to address those concerns. Staff and officials from the Iowa DOT, Iowa State Patrol, Governor’s Traffic Safety Bureau, Federal Highway Administration, Institute for Transportation, and local law enforcement and transportation agencies met to review crash data and discuss potential safety improvements to this segment of W-55. This report outlines the findings and recommendations of the road safety audit team to address the safety concerns on this W-55 corridor and explain several selected mitigation strategies.